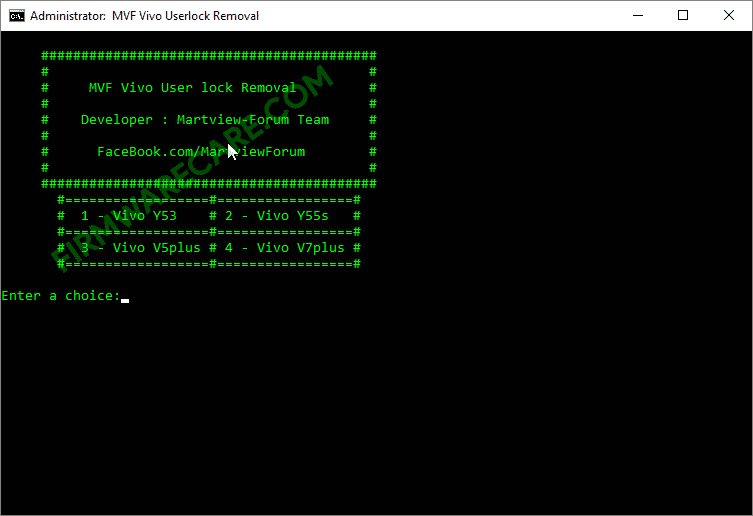 MVF Vivo User Lock Removal is a small application for windows computer created by Martview Forum Tool, which allows you to remove or bypass the user lock protection from your Vivo devices. MVF Vivo User Lock Removal supports various Vivo devices such as Vivo Y53, Vivo Y55s, Vivo V5 Plus and Vivo V7 Plus. MVF Vivo User Lock Removal tool is an efficient tool to remove lock from your Vivo devices. Since, this is an open source tool, you may use it free for always to bypass userlock on your Vivo devices. The supported models are Vivo Y53/Y55s/V5 Plus and Vivo V7 Plus. In order to use the MVF Vivo Lock Removal, you need to install the Universal ADB Driver on your computer. [*] Compatibility: The MVF Vivo Lock Removal Application runs perfectly on Windows XP, Windows Vista, Windows 7, Windows 8, Windows 8.1 and Windows 10 (32 bit and 64 bit). [*] Credits: MVF Vivo User Removal is created and distributed by Martview Forum Tool (developer). So, full credits goes to Martview Forum Tool (developer) for sharing the tool for free.